Alexa is a Bay Area native from Belmont, CA who is excited to join the CHC clinical team! She is a Columbia and UCSF trained Psychiatric Mental Health Nurse Practitioner (PMHNP) who provides comprehensive psychiatric evaluation and medication management for children and adolescents in the community. She is a strong advocate for health and wellness in her patients and emphasizes the role that sleep, nutrition, exercise and socialization have on how her patients feel. 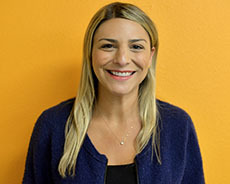 Before pursuing advanced practice nursing, Alexa worked for several years in the adolescent residential eating disorder treatment setting and then worked as an RN in Edgewood’s youth crisis stabilization center in San Francisco as well as in the school setting. She received her NP training working with both children and adults in a variety of outpatient, crisis, residential, urgent care, jail and community settings until completing her final residency at Palo Alto Medical Foundation in Mountain View. She wrote her Masters thesis on a literature review of the efficacy of psychotropic pharmacotherapy in patients with Anorexia Nervosa. During her spare time, Alexa enjoys spending time with her family and friends, skiing in Arnold, going for runs and discovering food gems on the Peninsula. Her latest creative outlet is making floral centerpieces for her friends’ weddings and showers.